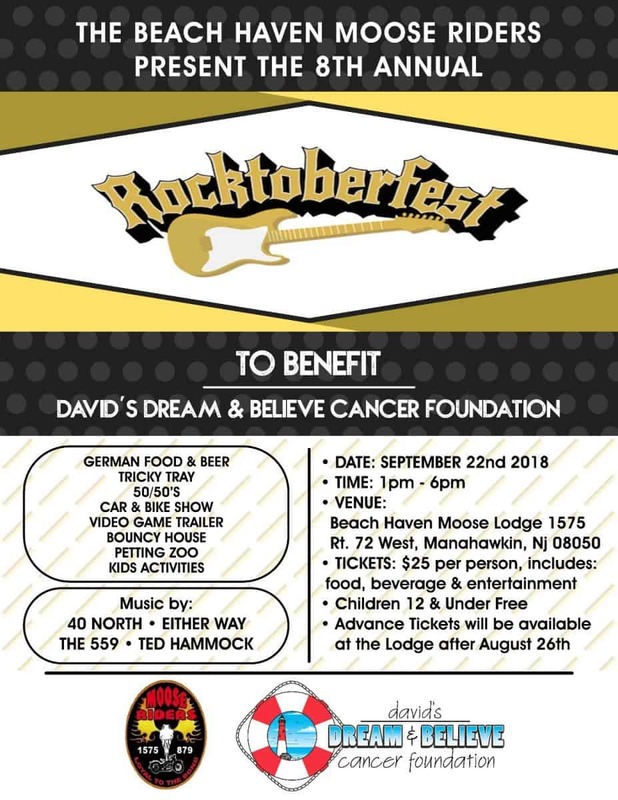 Please join our Community Partners, Beach Haven Moose Riders for ROCKTOBERFEST on Saturday September 22nd from 1-6pm at Beach Haven Moose Lodge 1575, Route 72 West, Manahawkin, NJ 08050 to benefit David’s Dream & Believe Cancer Foundation. This is always one of our favorite family events of the year and hope you will join us. 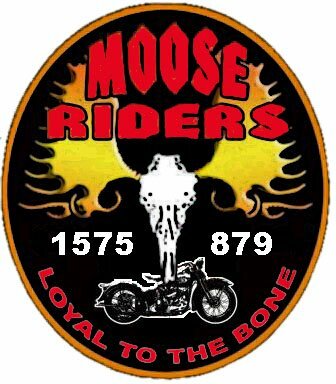 Advance tickets can be purchased after August 26th at the Beach Haven Moose Lodge . 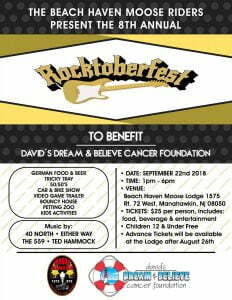 Tickets: $25.00 per person (Includes: Food, Beverage and Entertainment) German Food & Beer, Tricky Tray, 50/50’s, Car & Bike Show, Petting Zoo and Bouncy House. 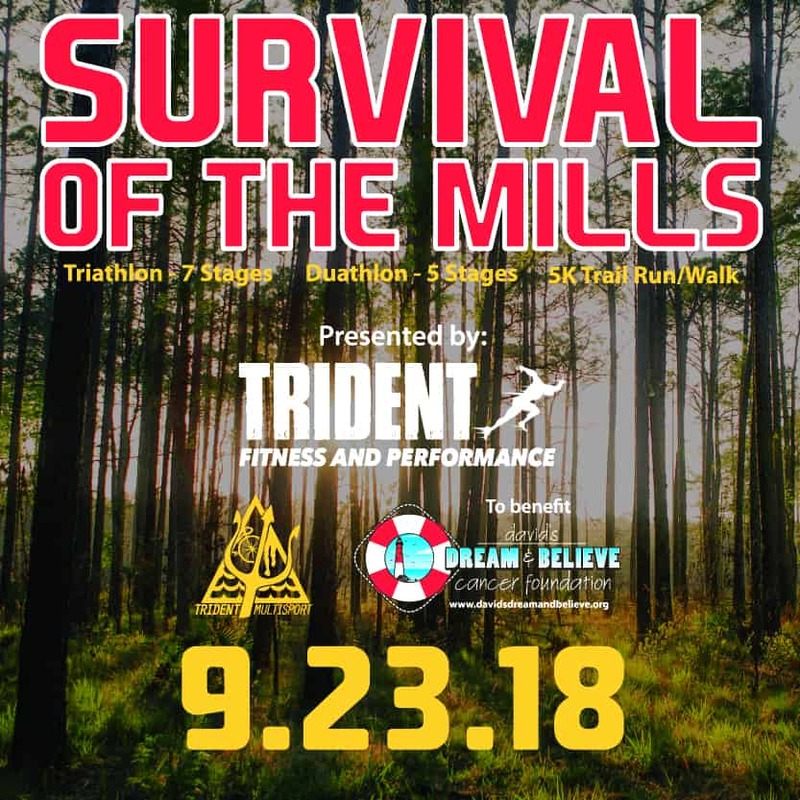 Please join us for the 5th Annual Survival of the Mills presented by our friends and service-arm partners at Trident Fitness & Performance to benefit David’s Dream & Believe Cancer Foundation on Sunday September 23rd at Wells Mills County Park in Waretown, NJ. Our competitors can choose one of three challenging races including: a 7-stage Triathlon, 5-stage Duathlon or a 5K Trail Run/Walk. 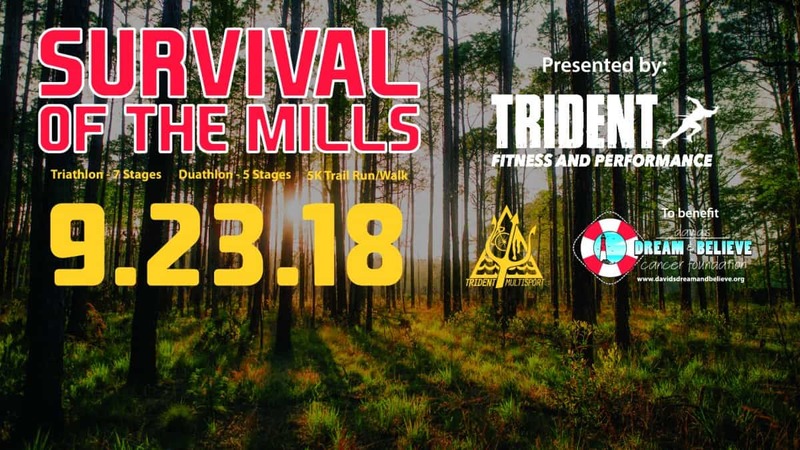 Our friend Ross Reynolds from Trident Multisport is the race creator/organizer/director. 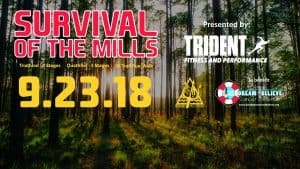 Ross and his wife Marissa are the backbone for both of our athletic fundraisers with Survival of the Mills and Run for Hope. Their continued support for our families battling a cancer diagnosis is greatly appreciated by all of us at the Foundation. 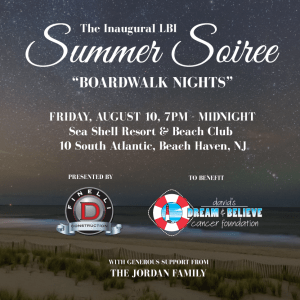 We are thrilled to announce that the Inaugural LBI Summer Soiree presented by D. Finelli Construction is SOLD OUT! Thank you to everyone who has reserved their spot for “Boardwalk Nights” at the Sea Shell Resort & Beach Club – if you’ve missed this opportunity but would still like to support our mission as A Beacon Of Hope, please visit bit.ly/DonateDDBCF. We are excited to bring the Inaugural LBI Summer Soiree “Boardwalk Nights” (formerly Island Gala) to the Sea Shell Resort & Beach Club on Friday August 10, 2018 to benefit David’s Dream & Believe Cancer Foundation(DDBCF). The LBI Summer Soiree “Boardwalk Nights” is brought to you by our friends, community partners and Title Sponsors at D. Finelli Construction. 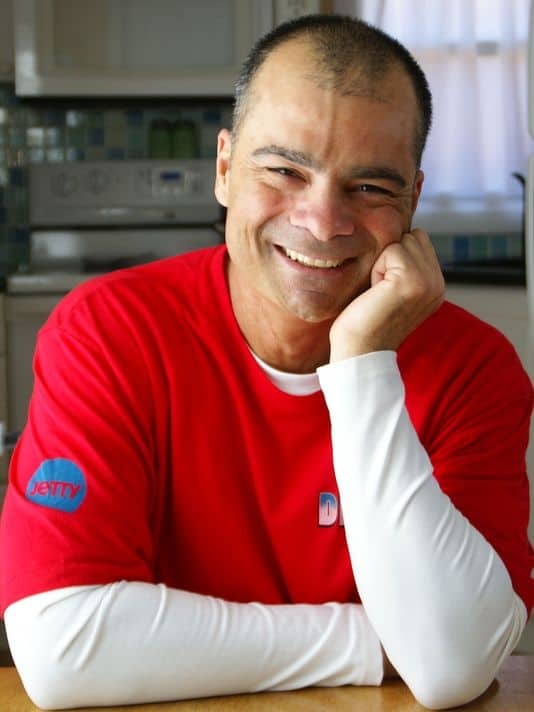 Dave Finelli was recently welcomed to DDBCF’s Volunteer Advisory Board, and according to both Dave and his wife Laurie Finelli, their faith in God is the cornerstone of everything in their lives. Dave and Laurie have shared that they feel blessed to be able to support organizations such as DDBCF, Parker’s Army, Hope for Liberia, Fighting Children’s Cancer Foundation and Lighthouse Christian Academy. We also want to warmly welcome and extend our sincere thanks to The Jordan Family for their generous support of the Soiree. Bill and Kirsten Jordan were introduced to DDBCF a few years ago at the Island Gala by the Reynolds Family and since that initial meeting have been unwavering in their support for our families battling cancer. We return to the Sea Shell Resort & Beach Club for the 6th year of this re-branded event and are so excited that Jaimee Hughes Boyle and Brittany Hughes Solon were also recently welcomed to DDBCF’s Volunteer Advisory Board. The Hughes Family supports DDBCF at multiple events throughout the year and have done so since our first year of existence. We are grateful for their steadfast and generous support! The LBI Summer Soiree “Boardwalk Nights” is our take on an upscale summer cocktail party at the breathtaking Sea Shell Resort & Beach Club. The event will be held from 7pm – Midnight on August 10th and will feature: live boardwalk games, scrumptious hors d’oeuvres, a robust buffet, creative cocktails with 3-hour top-shelf open bar, spectacular auction and live music with LBI’s Ted Hammock and Jason Booth in our outside Tiki Lounge with Philadelphia’s High-Energy Seven Piece Band LOVE 77 to keep you moving all night long on the ballroom dance floor. Hate cancer? Looking to fight this monstrosity with a fire that burns hotter than a thousand suns? 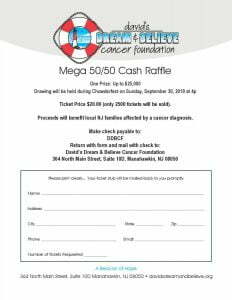 Ready to pump out your hard-earned cash to support our local families struggling through the pain and uncertainty of a cancer diagnosis? Looking to bring light to the darkened skies of a heinous disease that touches us all? Then please help us help local families—and they will know they are not in this fight alone. Come spend a memorable summer evening at The Union Market & Gallery with us. We invite you to experience great food, beer, wine and music sourced locally. We cannot do any of this without you. 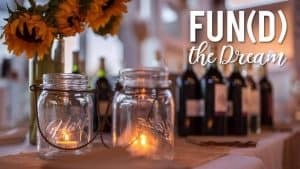 Weather NJ & Friends, The MakeShift Union and David’s Dream & Believe Cancer Foundation are proud to introduce Fun(d) the Dream, a fun mid-summer music dinner party that funds cancer assistance. This rain or shine event will take place July 14, 2018 from 5:00-9:00 pm. 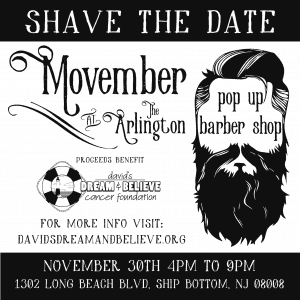 All event profits will benefit David’s Dream & Believe Cancer Foundation. The cancer assistance efforts of DDBCF are unparalleled in the local area and we’re extremely happy to support this noble local cause. 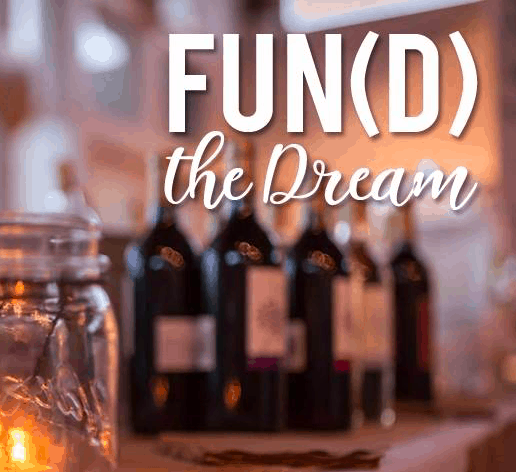 Fun(d) the Dream will feature live music by upcoming local artists Sahara Moon and August and Oak, craft brew by Pinelands Brewing Co and award-winning wine from New Jersey’s Valenzano Winery. Expect a charcuterie appetizer bar, jumbo sea scallops, farm-fresh vegetables, phenomenal desserts by Sweet Melissa and many other delicious eats. We’ll also have fresh cold ice tea, lemonade and water available to quench that thirst. All this is included in the ticket price. We hope to see you there! 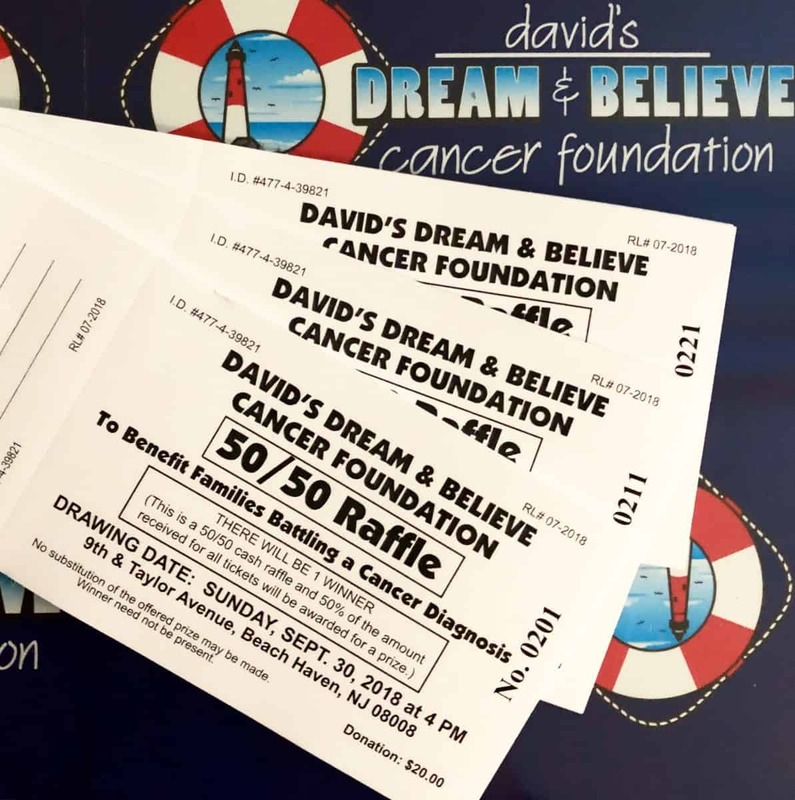 Please purchase your tickets here, and email Executive Director for DDBCF, Danielle Corso dani@davidsdreamandbelieve.org with any questions. 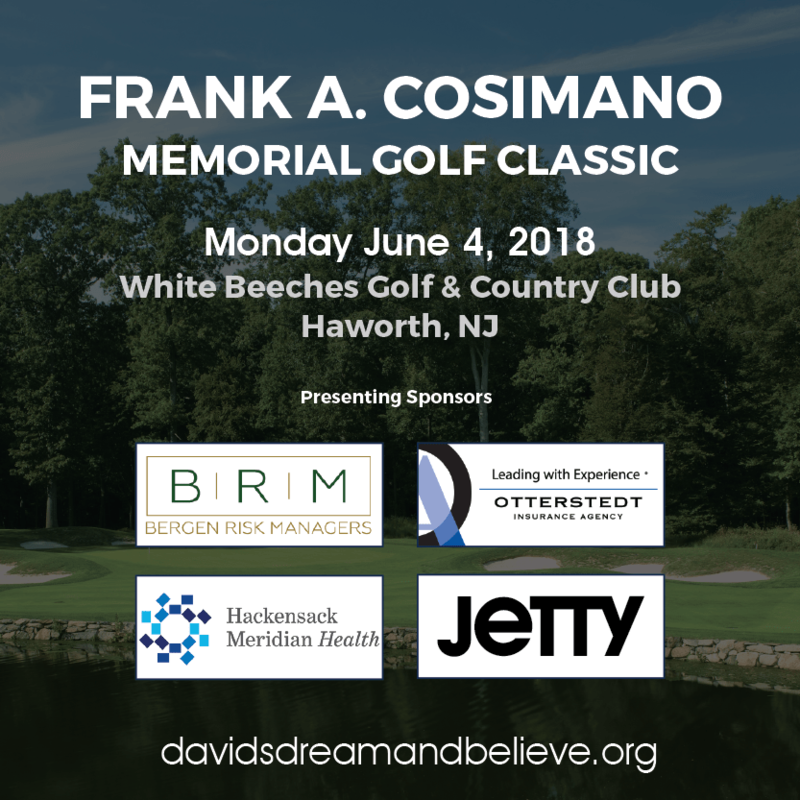 The 3rd Annual Frank A. Cosimano Memorial Golf Classic presented by: Bergen Risk Managers to benefit: David’s Dream & Believe Cancer Foundation (DDBCF) with support from: Hackensack Meridian Health, Otterstedt Insurance Agency and Jetty took place at the beautiful White Beeches Golf & Country Club on Monday June 4, 2018. The Cosimano and Caldarella families have a friendship that spans decades. 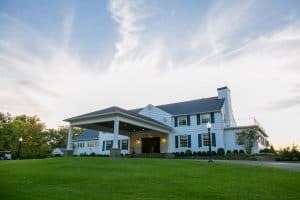 88 Golfers joined us at White Beeches Golf & Country Club on Monday June 4th to remember and honor Mr. Frank A. Cosimano while “Paying it Forward” in his name. The end result was an incredible $28,309.16 raised for families battling a cancer diagnosis! A Huge Thank You to DDBCF Board Member, Jason Cosimano, Kim Cosimano and Mrs. Angela Cosimano for serving as Co-Chairs for this event. Thank you to our Golf Committee: Mr. Leonard Kaiser, Mr. Stephen P. Sinisi Esq., Mrs. Jaqueline Ceccarelli-Komsa, Mrs. Lauren Komsa Curtis, Mrs. Christina Ulmer and Mr. Todd and Michael Accomando. We could not have coordinated this event without the support, time and efforts of the Golf Committee. A special thank you to Mrs. Jaqueline Ceccarelli-Komsa, Mrs. Lauren Komsa Curtis and Mrs. Christina Ulmer for procuring our amazing auction items! Thank you to Greg Porcino from Golf Event Management. Greg and David Caldarella started to discuss the possibility of a golf event to honor Frank A. Cosimano in late 2015 before David brought the idea to Jason, Kim and Mrs. Cosimano. Greg has played a pivotal role in bringing his expertise to this event. Thank you to the incredible staff at White Beeches Golf & Country Club. Thank you to all of our Sponsors starting with our Presenting Sponsors: Bergen Risk Managers, Otterstedt Insurance Agency and The Joseph C Parisi Sr. Charitable Foundation. Thank you to our Titanium Sponsors: The Shamsey Family, The Parisi Foundation, Meese Sports Medicine and Orthopaedic Center & Dr. Michael Meese and IGEA Brain & Spine and Dr. Ciro Randazzo. Thank you to our Gold Sponsors: Angela Cosimano, Insurance Design Administrators, Leonard & Barbara Kaiser and John J. Feczko, PC. Thank you to our Silver Sponsors: Keenan and Doris LLC, Charles & Janet Cerullo, Chris DiMatteis – Equity Prime NJ, InterChem, James V. Gardella – Professional Insurance Associates, John Brancato – JAB Inspections, John & Sara Faliveno, Mike & Nancy Petriella, Panzone’s Pizza, Robert McGuire, Stephen P. Sinisi, ESQ., Teresa Benigno. Thank you to all of our Bronze and Copper Sponsors. A special thank you to our “Hole in One” partners at Cadillac of Mahwah. Thank you to our 88 golfers and 125 dinner guests for taking time out of your busy lives to spend it with us to support our families battling a cancer diagnosis. Congratulations to John Shamsey, Chris Long, Pepper Deturo and Dr. Carlos Sagebian for winning First Place in the scramble. We hope everybody enjoyed themselves and hope to see you next year. 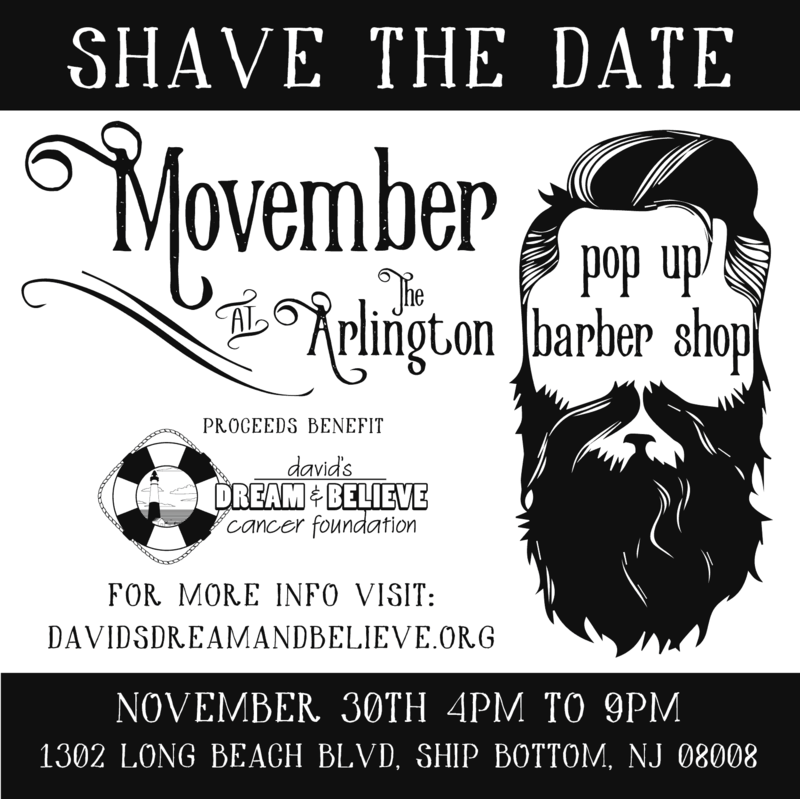 Thank you from all of us at David’s Dream & Believe Cancer Foundation and the Cosimano/Caldarella Families! 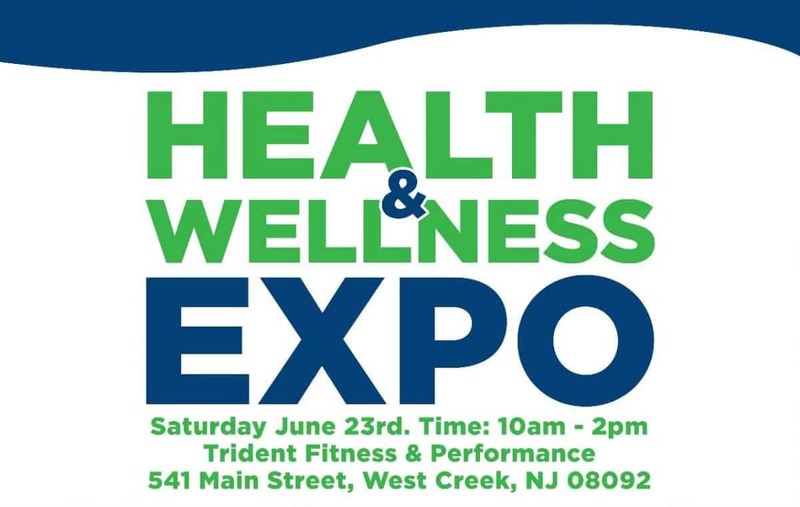 Please join David’s Dream & Believe Cancer Foundation and our newest service arm provider Trident Fitness & Performance as they host a Health & Wellness Expo on Saturday June 23rd between 10am and 2pm. We met owners Carolyn Card and Paul Hafner a couple months ago and we instantly knew we wanted to work together to better the lives of families battling a cancer diagnosis. The idea for a Health & Wellness Expo was created and several of our existing service arm providers wanted to lend a hand as well as some new ones. Fitness Training with experienced Trident Instructors every hour starting at 10am. $20 donation. DDBCF Service Arm provider, Body in Mind Massage offers complimentary chair massages. $10 donation. DDBCF Service Arm provider, Justine LaBatch, LMFT will offer complimentary self-esteem boosting interactive art therapy for all ages. Ann Luyber will offer Henna for adults and children. $10 donation. Complimentary skin screenings with Dr. Stephen Small from Ocean Plastic Surgery. DDBCF Service Arm Provider, Taryn Parascand from Living Acupuncture will offer a complimentary 45-minute qi gong class for breast health at 11am. DDBCF Service Arm provider, Liquid Bliss Yoga will offer a Free Yoga Class. $10 donation. Trident’s Recovery Station is an area to congregate, get to know new people, relax after your workout and refuel your body in a healthy way! 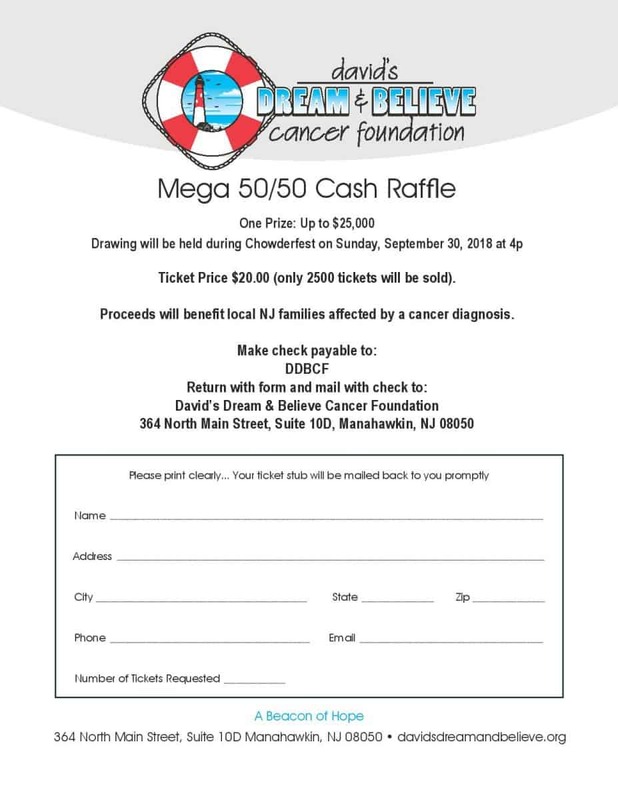 Our 6th Annual Frank V. Panzone Jr. Memorial Cruisin for a Cure presented by Barlow Buick GMC Manahawkin with generous support from Panzone’s Pizza to benefit David’s Dream & Believe Cancer Foundation held this past Sunday was another tremendous success. The day is always special regardless of the weather, and this year’s event included a surprise announcement that no rain or clouds would dampen. Earlier this year, a unanimous “secret” vote by (all but one) DDBCF Board members moved forward the decision to honor long-time DDBCF supporters Kristin Moritz, Joyce Panzone and Jillian Elsasser from Panzone’s Pizza in Surf City and Panzone’s Pizza & Pasta in Beach Haven, NJ with our 2018 Beacon of Hope Award. The decision to honor these 3 amazing women was easy but keeping it a secret from Vice President of DDBCF, Kristin Moritz and DDBCF Advisory Board Member, Jillian Elsasser was the difficult part. 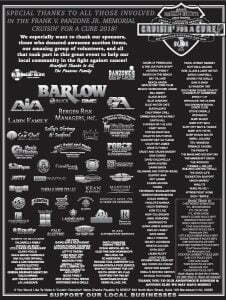 On behalf of the DDBCF Board of Directors; I would like to thank our sponsors, riders, party guests, volunteers, businesses and individuals who donated food and activities for helping to make the 6th Annual Frank V. Panzone Jr. Memorial Cruisin for a Cure presented our most successful Cruisin to date. A special thanks to our host Danielle Pessolano and staff from Joe Pop’s Shore Bar & Restaurant. Thanks to the “Generosity of Spirit,” of so many, we were able to raise more than $48,000 for families battling a cancer diagnosis. 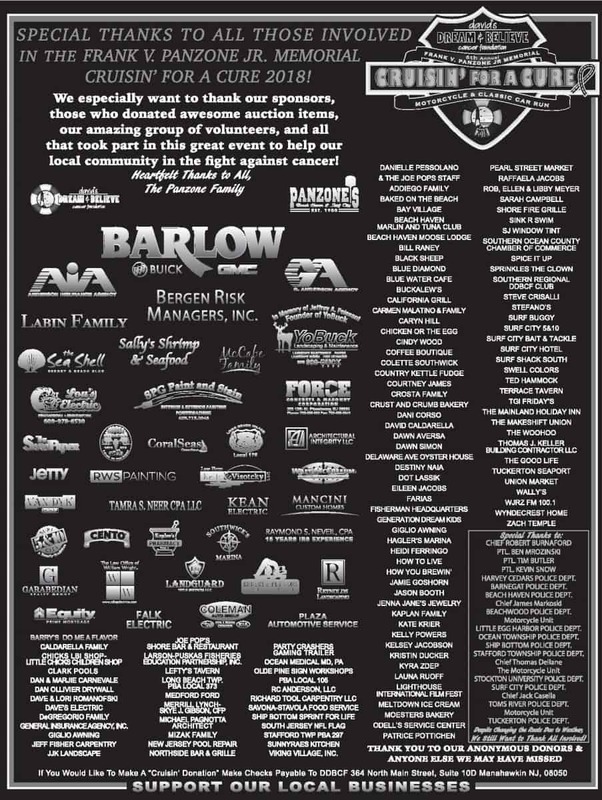 The image below includes every individual and business that donated to this event in some capacity – thank you ALL. It is because of your generous support, that DDBCF has been able to help 1,053 Families with over $825,000.00 in direct patient financial aid (January 2011 – March 31, 2018). THANK YOU!